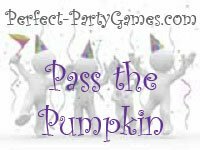 Summary: Pass the Pumpkin uses a miniature pumpkin that must be passed around without using hands. Recommended Number of Players: At least two teams with between 6 to 8 players each. Have the team members line up in a straight line. The player at the beginning puts the miniature pumpkin under their chin with their hands behind their back. The pumpkin is passed to the next player in line using only their chin as well. No hands can touch the pumpkin. If the pumpkin falls to the ground or is touched by hands, the team must begin again at the first player. The team that successfully passes the pumpkin from chin to chin in the least amount of time wins.